Elvis, the Romeldale ram has all the siring duties at Riverslea. 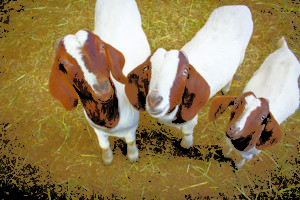 Three Boer goats with floppy ears. Also, the Conrads do not cut back the tails on any of their sheep or goats. Colorful balls of roving and yard and hand-dyed by Liz using minimal chemicals. First baby lamb of the season. Brood ewes are also wool producers. The Conrads also buy sheep and goats from neighboring farms to finish and take to slaughter. The goat here is a Nubian, the first breed that the Conrads raised. One of the brood sheep ready to give birth in April. Sheep farming was big business in New Hampshire in the early 1800s. 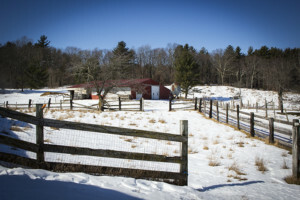 In Deerfield alone, there were some 2,000 head of sheep according to Steve Taylor, retired commissioner of the state Department of Agriculture. 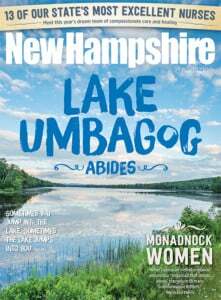 It was a boom time for New England, and gave rise to our textile mill towns. It was all about the wool. And it all went South, literally, after inroads by railroads and cotton farming gained popularity. What we have left from the era are those now-repurposed mill buildings and miles of picturesque stone walls that corralled the sheep. Sheep farming has changed its complexion in modern times. 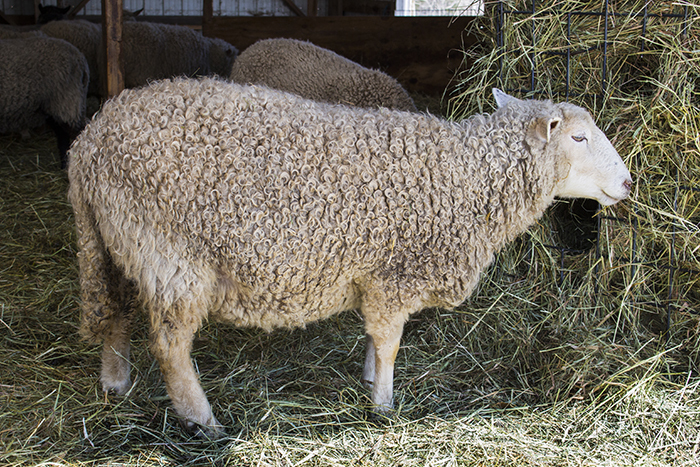 Breeding methods have fostered sheep that have good wool and are meaty. The face of the consumer is changing too. Riverslea Farm off of Rte. 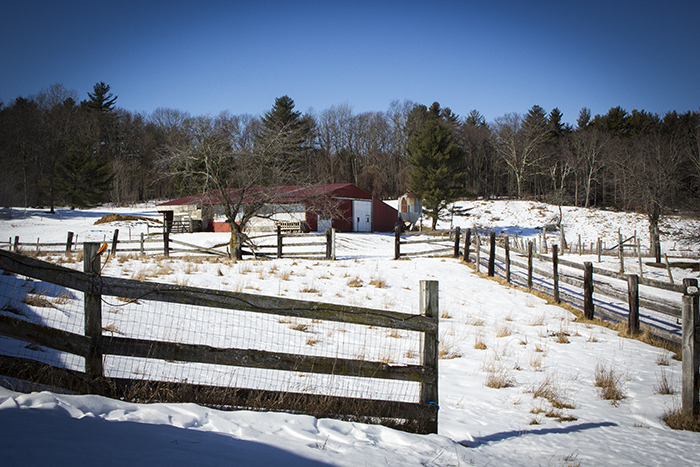 125 in Epping was once a typical, self-sufficient family farm with a white house, red barns and rocky fields. It appears very much the same today, thanks to restorations by the Conrads. But now, rather than producing a diversity of products, they simply raise sheep and goats. It started out as a hobby farm and a nice place to live, but after visiting an animal auction years ago, and witnessing the cruelty and confusion, the couple decided to raise animals from birth to end, all within their sight and as naturally as possible. Farm store open every day from noon to 6 p.m. except Wednesdays and Sundays. Closed on major holidays. Liz makes sheep farming sound like the most perfect circle of process and product. Their 200 animals graze on the grass, and come and go as they please. When I visited on a warm winter day, the flock, most heavy with pregnancy, were taking shelter in the barn and feasting on hay. Liz and Jeff had coordinated their conceptions for April deliveries, to be on hand for births in more clement weather, plus they had planned one of their few vacations in March. A few months back, they had purchased Elvis, a Romeldale ram, to do the deed(s). 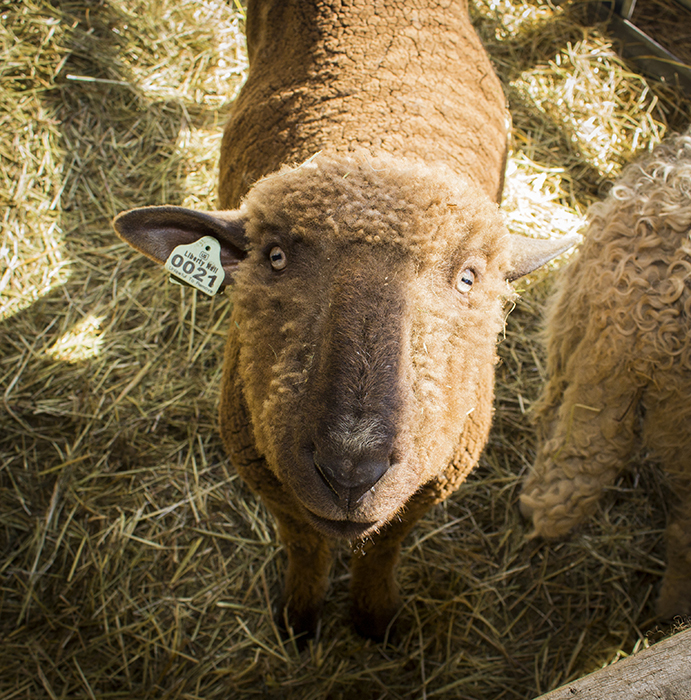 A handsome and curious fellow, he was quickly exhausted by the needy ewes, says Jeff. “You should have two rams in case the chemistry isn’t just right,” he adds. “But turns out Elvis was all we needed. 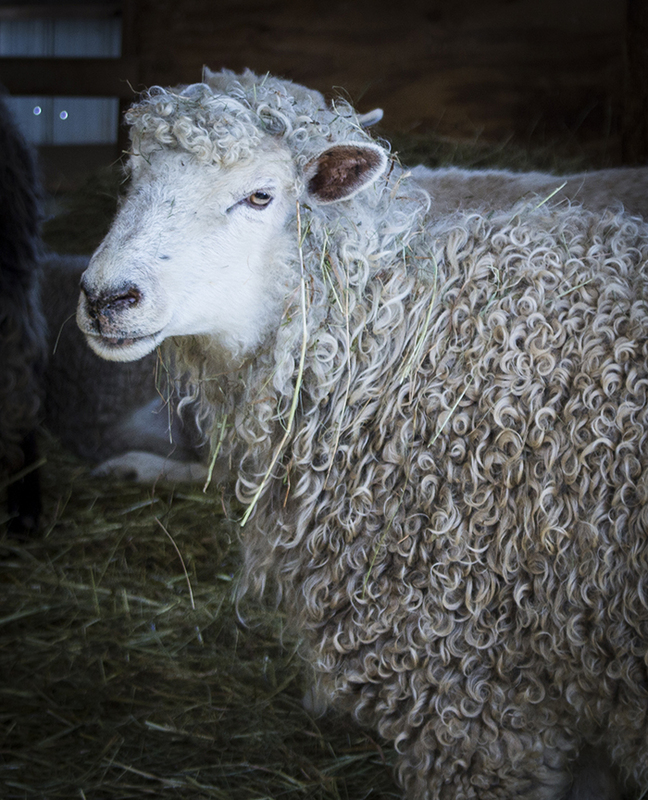 He just had to rest up after the first four days of love’s labor.” The Conrads’ flock is mostly sheep originally from the British Isles with breed names like Cotswold, Cheviot and Romney. They focus on Leicester and Dorset for the best attributes of both, including births of twins and triples from the Leicester and the rapid growth of the Dorset. Their breeding ewes give birth to about 150 lambs a year. Most go to slaughter at about five or nine months of age. The Conrads help with the birthing when necessary, and give the animals their shots and hoof care. Their veterinarian said a long time ago, “I’ll show you this stuff once. You can’t afford to have me out every time.” These are not show animals; they are grown and fostered for their ultimate destiny. One barn was obviously the receptacle for the fleece, another large part of the circle. When asked which product, meat or wool, produced the most revenue, Liz and Jeff had a little “conversation.” Jeff said “meat” and Liz just looked puzzled. But for sure, the wool is the most expansive byproduct. Every several months they truck 2,000 pounds of raw wool to Canada, to a mill that will do it all. That is, pick and wash the fibers, card to put the fibers in alignment and then spin the fibers into yarn. The fibers can also be left unspun as roving for felting or batts for quilting. What they bring back is yards of yarn, roving and woven wool blankets in shades of beige to brown. 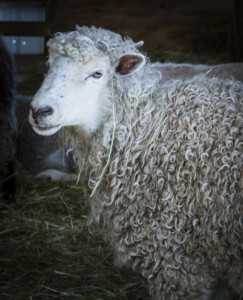 Jeff and Liz Conrad raise both sheep and goats on their 200 year-old farm, Riverslea.Their pet standard poodle, Lily, has a bit of a fleecey look, too. Outside the barn, another component of the sheep circle lay in a giant heap. “That’s our beautiful manure,” says Liz. The sheep leave their dung in the straw bedding and the heat generated by the mixture keeps it free of bacteria and awful smells. The sheep’s rumen, the first chamber of the animal’s alimentary canal, is a thorough processing chamber and the end product mixture is prized by gardeners. So they can sell that too. 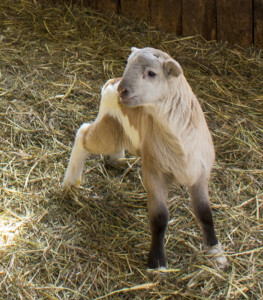 In another red barn, Liz and Jeff raise Boer goats from South Africa. It wasn’t until apartheid ended in 1994 that these more meaty and rather attractive animals could be exported to the US. 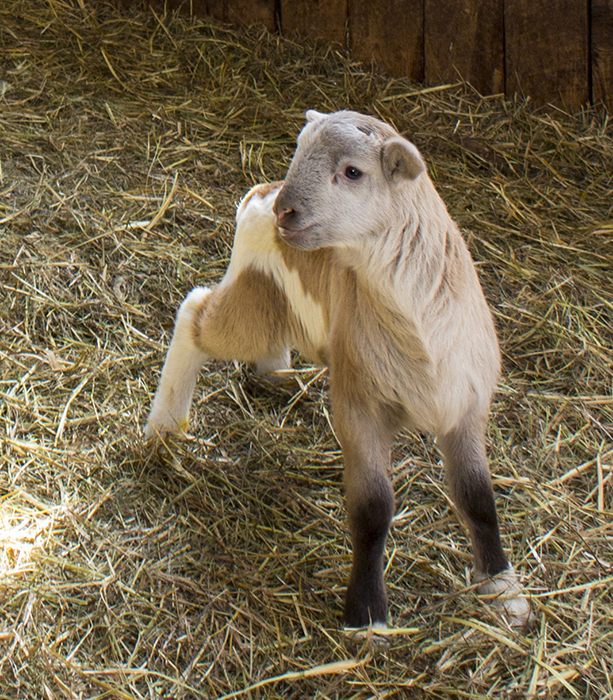 Like the sheep, they are raised on pasture and moved periodically to protect the land from denudement. That’s what happened to a very old apple orchard on the property. It’s gone, but not forgotten. Jeff says even now hunters come through with old maps asking for the whereabouts of the orchard. Sorry, but the goats ate it. 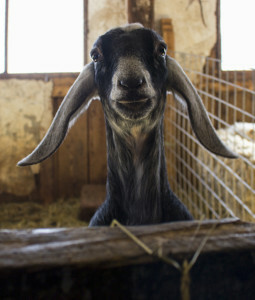 Every Monday, animals are taken to slaughter at a butchery in Rochester. Jeff is often accompanied by the customer who is buying the whole sheep or goat. It’s not so much Greeks anymore. New immigrants from Africa and the Middle East are interested in halal meat and the whole animal. They even Skype to the elders in Africa to ask for assistance in picking out the best beast. Prayers are said and the throat is slit. They don’t like the idea of electric bolt to the head. Before 9/11, customers came to the farm for the process, but Homeland Security quashed that, says Liz. The meat hooks now swing silently in the barn. The Conrads are thrilled that their lamb is on the menu at local restaurants, including Blue Moon Evolution in Exeter, Republic in Manchester and Black Trumpet in Portsmouth. Most of the chefs are now purchasing a whole animal, breaking it down in their kitchens and getting creative with using some of the small parts for sausage, soups and paté. It turns out lamb is very American after all. The full circle of the farm can be seen in the farm store. Its packed with yarns dyed colorfully by Liz, tanned goat hides, washable lambskins and a meat freezer offering every cut of goat and lamb. In the spirit of using every animal part, there are even buttons made of spinal bones by a local crafter. Liz takes the show on the road, bringing sheep and goat meat to the Seacoast farmers markets. 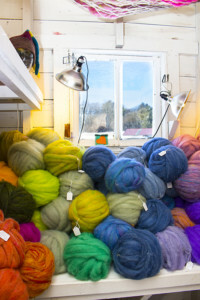 She also participates in local fiber fests and spinning workshops, with some held on the farm. Greek Easter is May 1, but if you don’t want to celebrate with a whole lamb rubbed with lemon, garlic and oregano and roasted on an outdoor spit turned by hand for seven hours, there are other options. The leg can be roasted in the oven or try a lamb burger. That will make you a lamb lover.